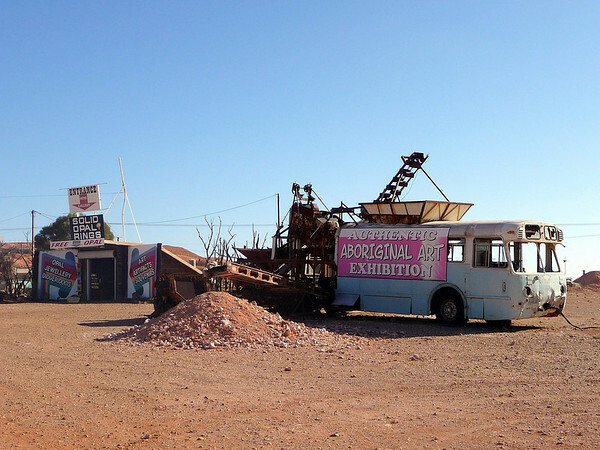 We left Australia's most famous outback town, Alice Springs, with mixed feelings. There's a cultural 'uneasiness' existing between the Indigenous People and Anglo-Saxon communities, that's for sure. 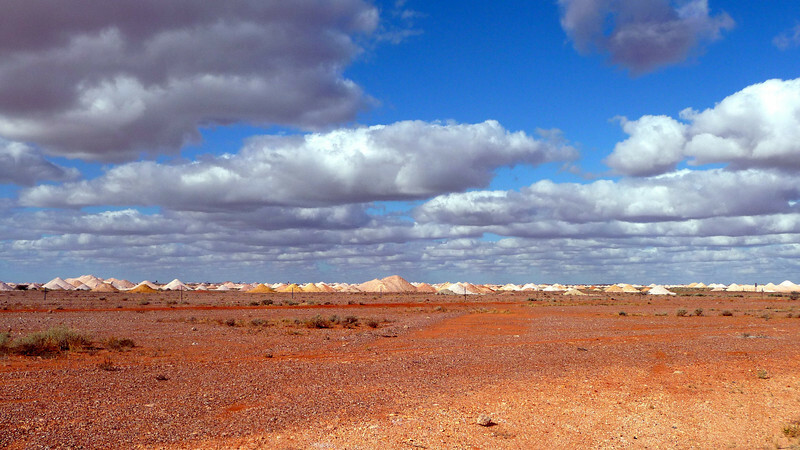 Very similar to what we picked-up over in Carnarvon, Western Australia; you can't help but notice it. In short, Alice's streets are not a place I could feel comfortable or at ease walking around alone at night. 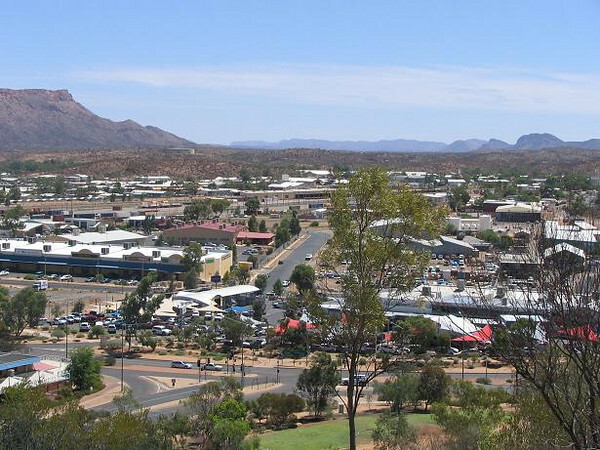 Damn shame, because Alice has a lot to offer; it's the commercial hub of Australia's Red Centre .. and provides all the conveniences, comforts and diversions of a good-sized modern town. The climate felt great too (in April); the sun shone through a clear bright sky .. as it does almost everyday of the year .. allegedly. 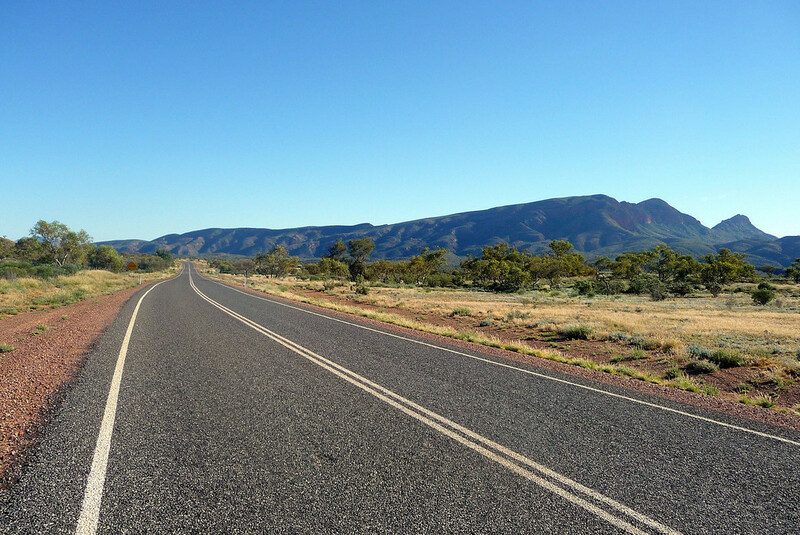 Compared to the Top End – where we've just come from – there's comparatively low humidity in the air too, which is far more tolerable for a couple of stray poms like us to cope with. BUT in a strange way (bearing in mind my Cornish tight-arsed mentality) .. the price was sorta worth paying. There are no TVs to watch at Glen Helen. Dunno if this is a good or a bad point to make .. after all, I'm really starting to get into the whole aussie rules football thing! 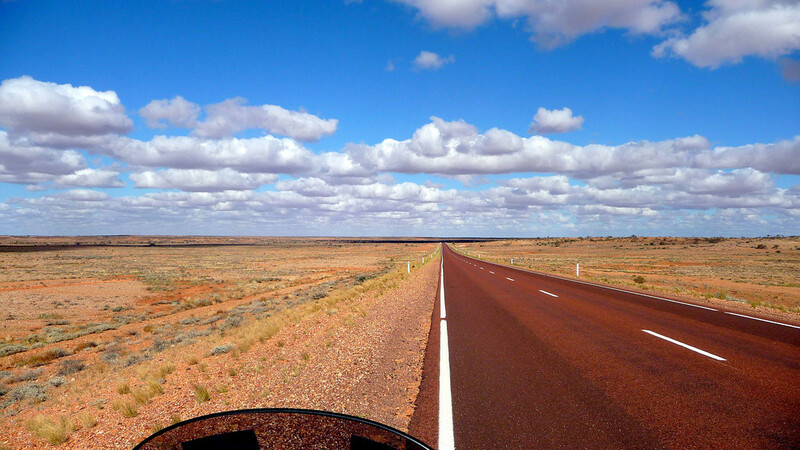 [I think I must be turning aussie] .. STREWTH, BLIMEY .. YOU BEWDY!! 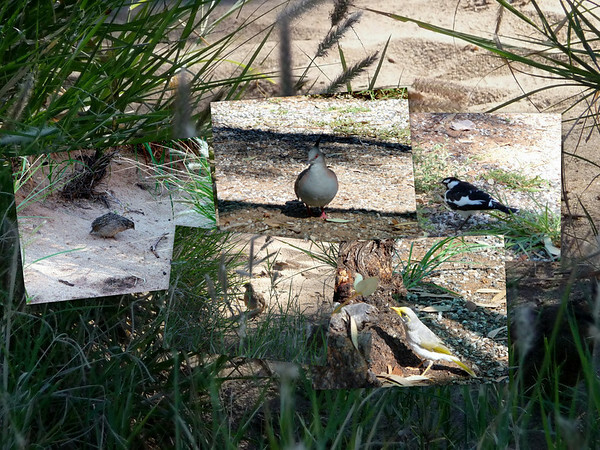 A little collage I made up. 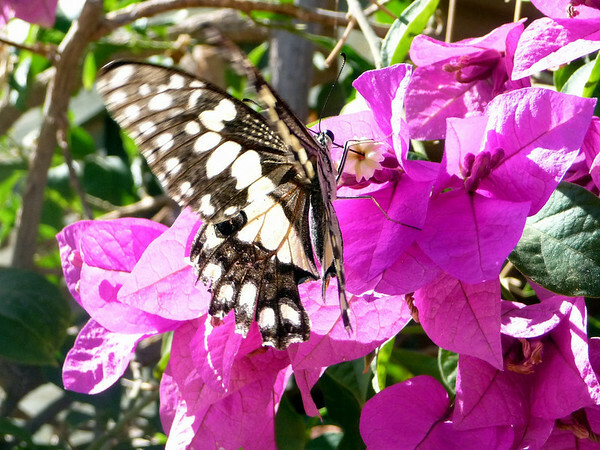 Tons of insect life everywhere too, as you would expect. Mr Spiderman here must've been 3-4 inches across. 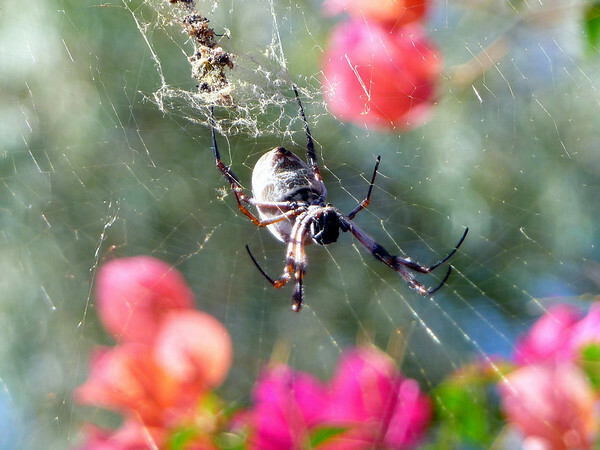 Did I ever mention my arachnophobia by the way?! 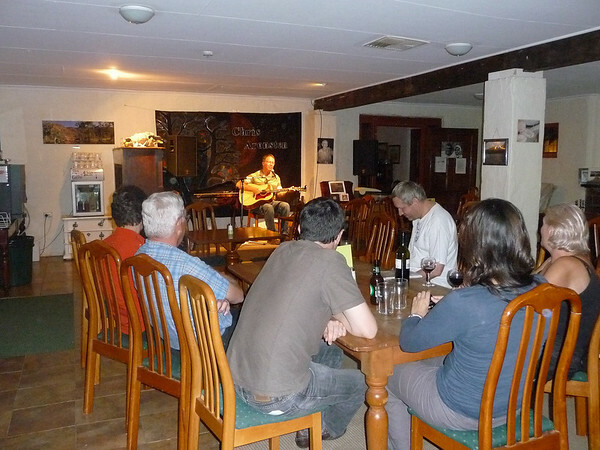 We also had some evening entertainment chucked into the bargain after a fairly good value-for-money in-house barbecue. Loadsa steak, sausage and lamb chops, plus the usual salads (@ 25 bucks /head). Did I mention that we're even getting a little fed-up with BBQs? 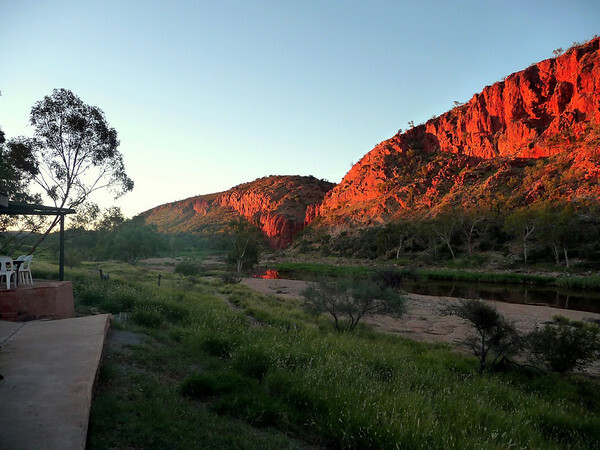 This is the scene from our lodging's doorway .. very first thing in the morning [around 06:30am]. Not a bad view to wake-up to, eh? Looking down river .. eastwards .. towards the rising sun. 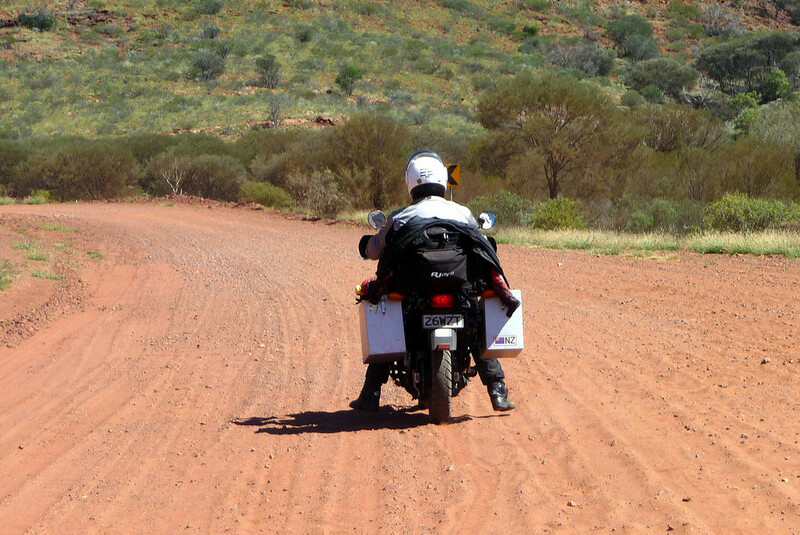 Now then, to clear-up a point of route planning that I've had to ponder for a while now, which is the issue of exactly what kind of road surface currently exists around the Mereenie Loop Road. 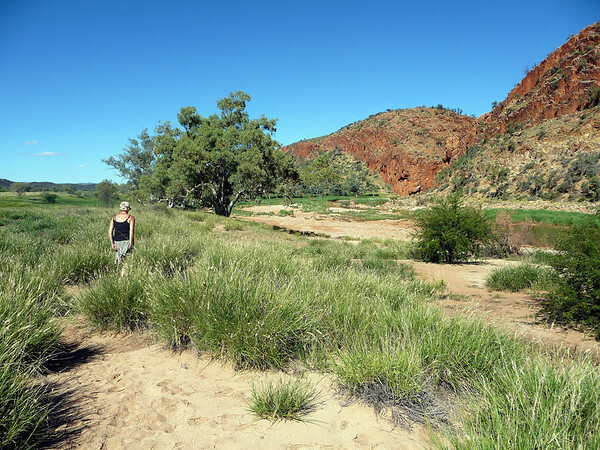 For your information: The Mereenie Loop takes you westwards for 226 km [141 mi] to Kings Canyon in the Watarrka National Park. 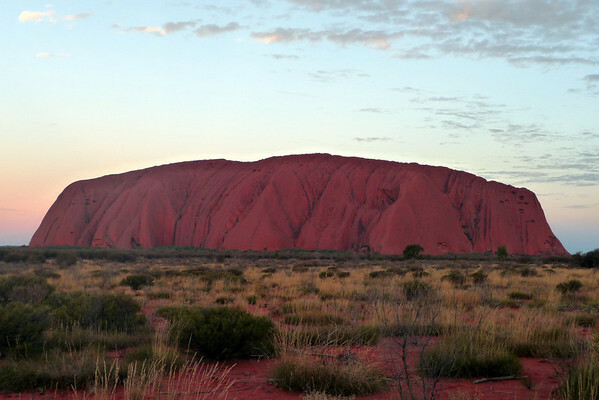 The journey then extends from Kings Canyon to Uluru (Ayers Rock) to the south. Naturally, therefore, I had always planned to ride around the Loop. 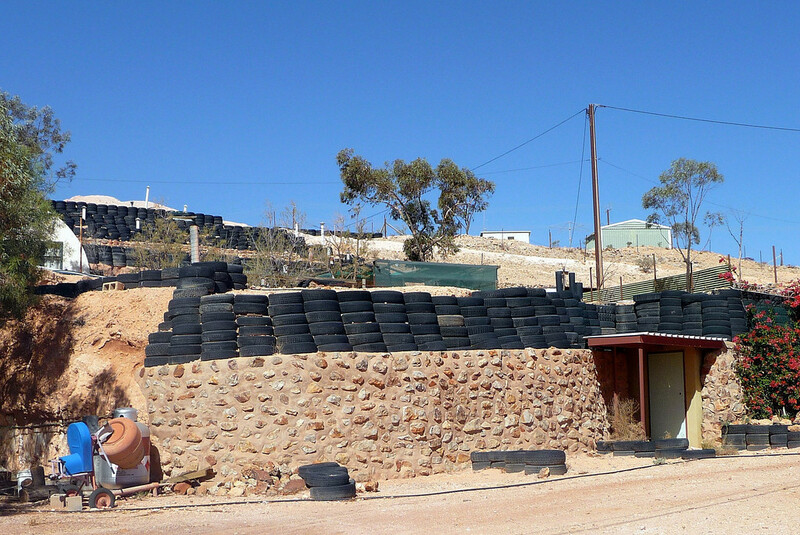 So obviously I was keen to know the up-to-date position .. as such, I approached Colin, the boss of the Glen Helen Resort – who's also a fellow biker – to ask him how much of the road surface from his place has now been tar-sealed. By nine o'clock we had filled the Alp's tank; got our Aboriginal traditional owners 'permit' [cost = 3-bucks] to pass through and around the Loop ..
.. and then we were off down the last 25-30 or so kilometres of the West MacDonnel Range towards the Mereenie Loop Road, on what clearly appeared to be, as expected, a brand new tarmacadam road surface. 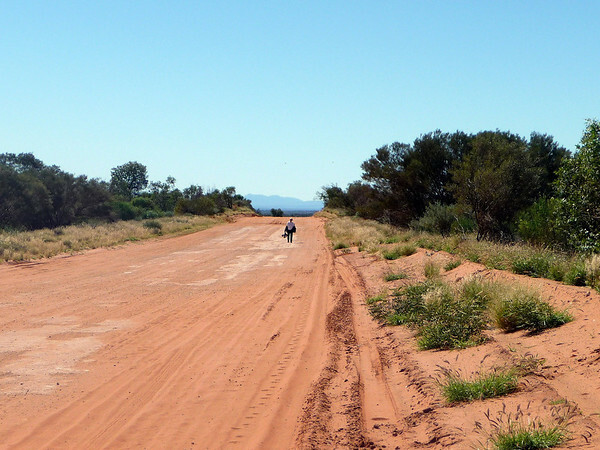 50 km [31 mi] down the road and we hit sand! I mean soft, powdery-type stuff about six inches to a foot deep in places ..
.. and I drop the bike onto its ride-hand side! Well, more of a gently 'lay-down' really .. therefore, no damage incurred whatsoever. 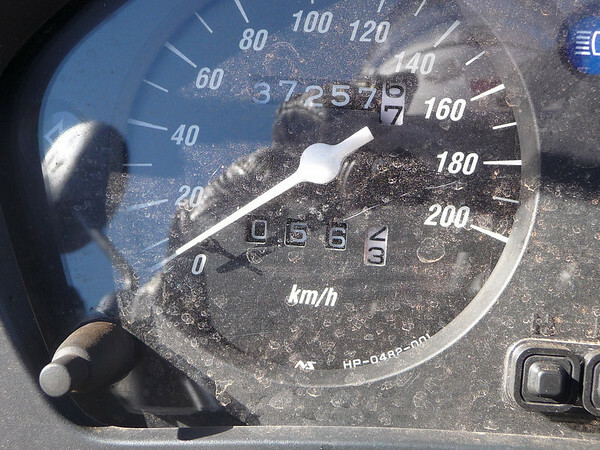 After all, a nil km/h lay-over onto a thick cushion of talcum powder just doesn't bruise anything .. except your ego! 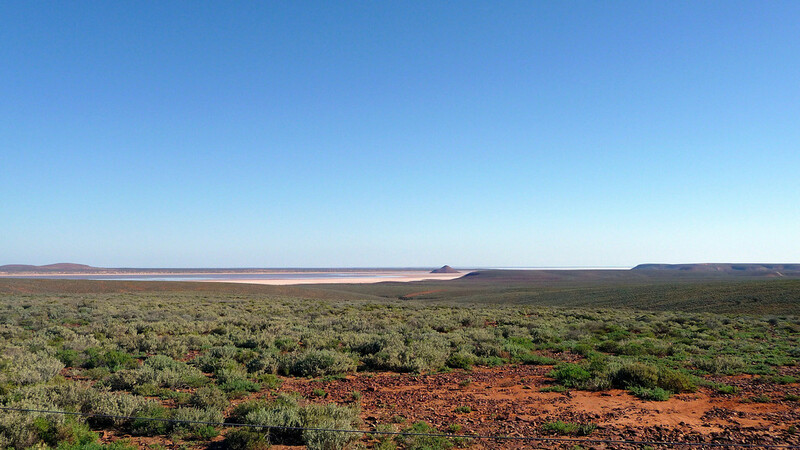 A further 6 km of struggling across a very unstable surface ..
.. and we were through it. PHEW! 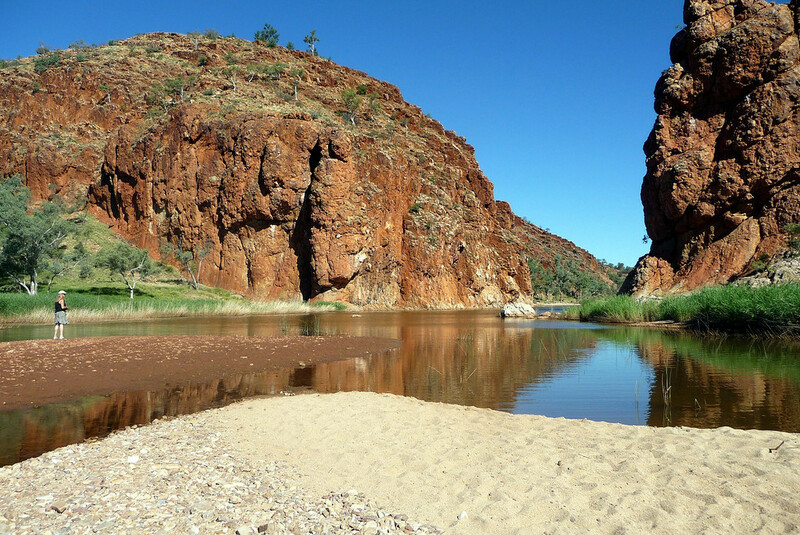 .. that was the bidda fun part, now let's crack-on to Kings Canyon. 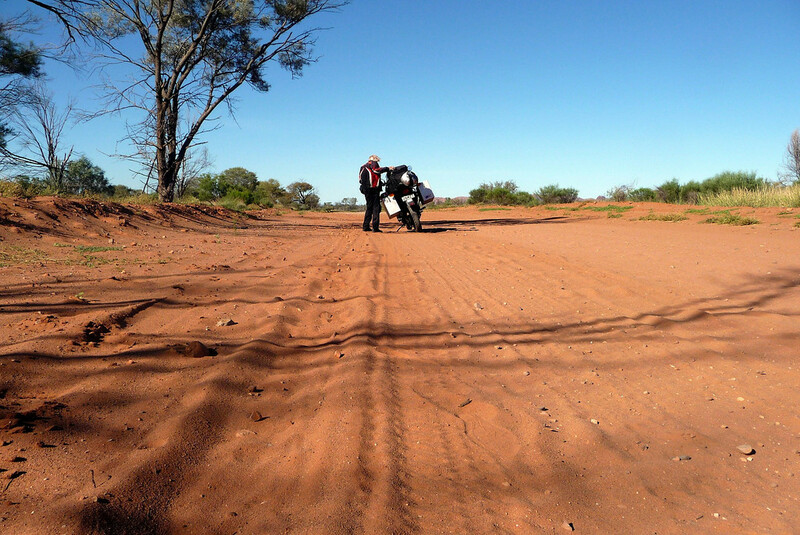 The tarmac lasted for only another 16 km [10 mi] before we were back on sand and corrugated gravel and dirt, which more-or-less stretched-out .. for the next 138 km [86 miles]! Huh? .. WTF? .. this is quite au contraire to my 'reliable' [?] sources of expert local knowledge! right? 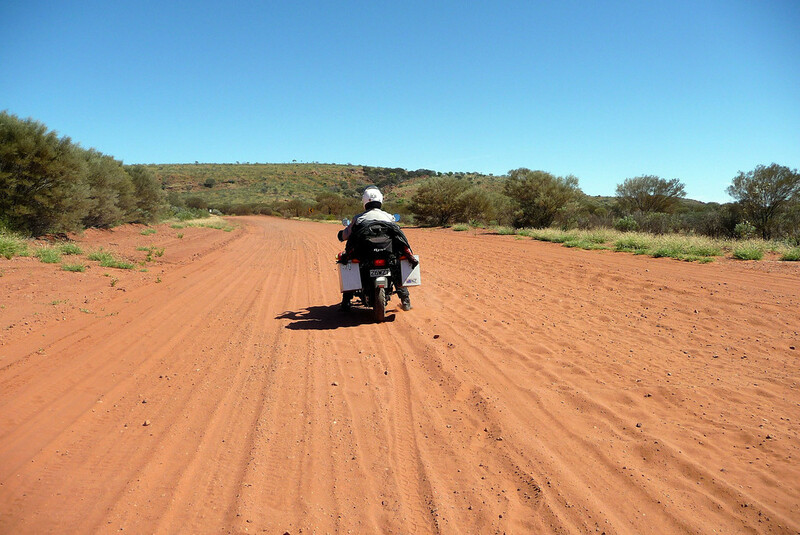 There were times when the ground was soooo powdery that Ellen had to get off and walk behind to allow me to snake and paddle my way through the soft surface on my own .. riding the clutch in-and-out, in bottom gear, a good deal of the time. 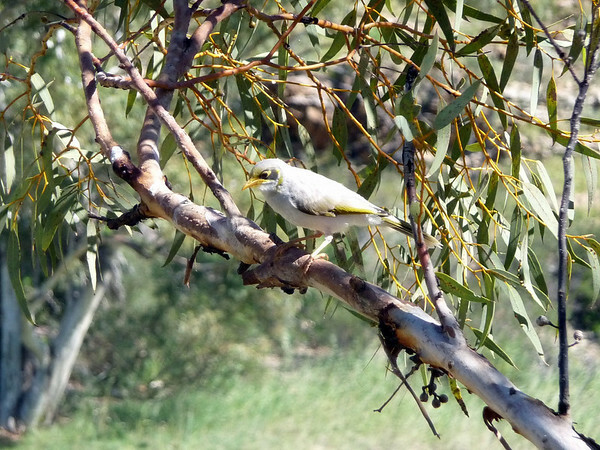 .. and then she would catch me up .. in the 35ºC heat of the midday sun. 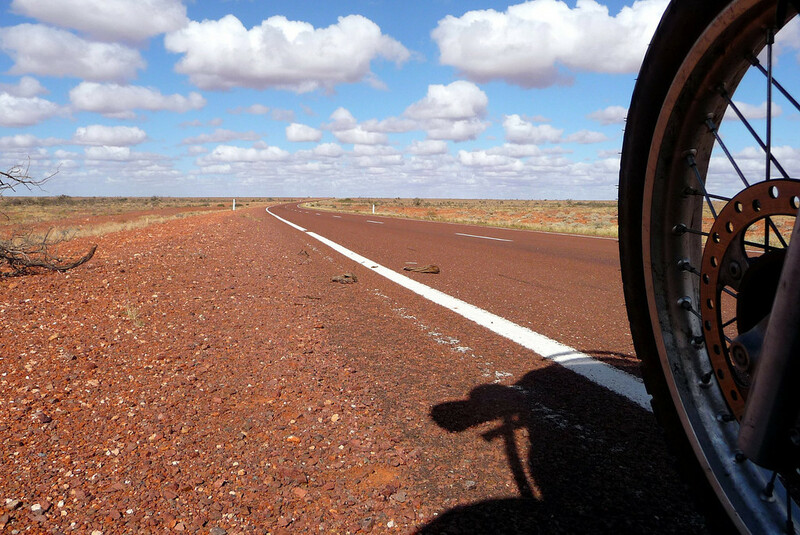 It was as times like this, temporarily on my own, as I waited for her to catch-up – with engine turned off, hearing it crackle and hiss in a groaning protest at being forced to work so hard – that I wished I still smoked. It would have been the perfect time to light up a fag .. no question! And so the whole process would repeat itself, time after time, for the rest of the afternoon. 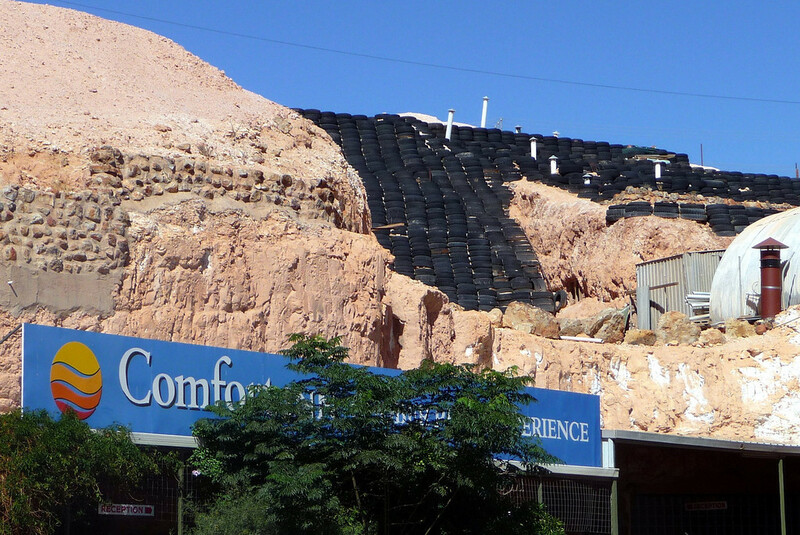 If it wasn't sand, then it was corrugated gravel & dirt. Picking out a decent line to ride through, hardly ever getting out of second or third gear .. getting shaken and rattled to bits in the process. We all suffered .. the hardscrabbling bike's suspension in particular! 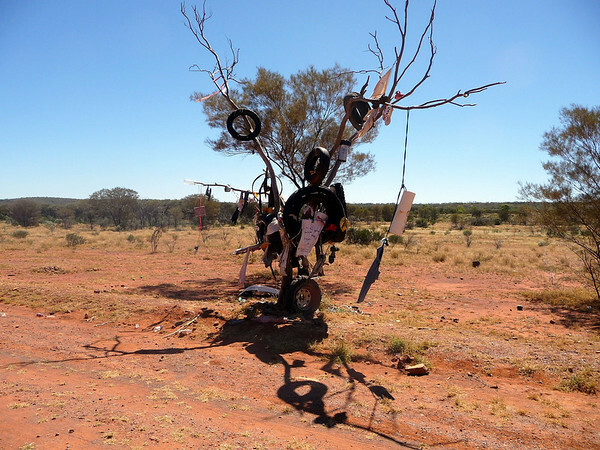 There were some good scenery along the way though ..
We even passed a type of 'tree of shame' .. although I don't know what its significance is? By 5:00pm, we were back on a hard surface again .. hallelujah! 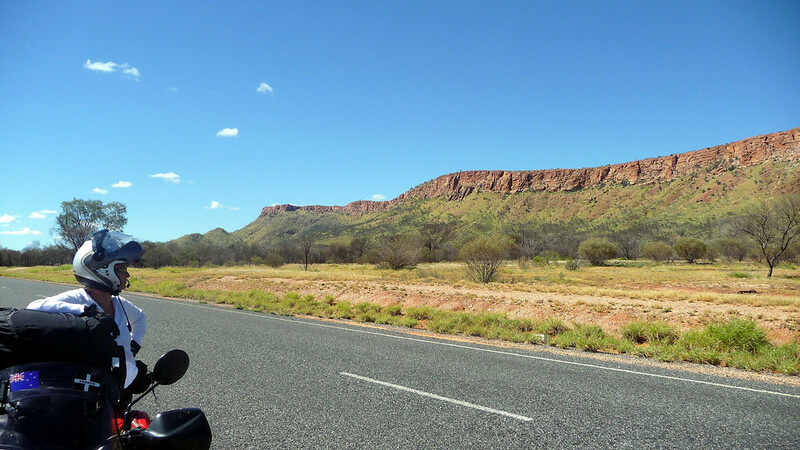 .. and racing toward King Canyon. 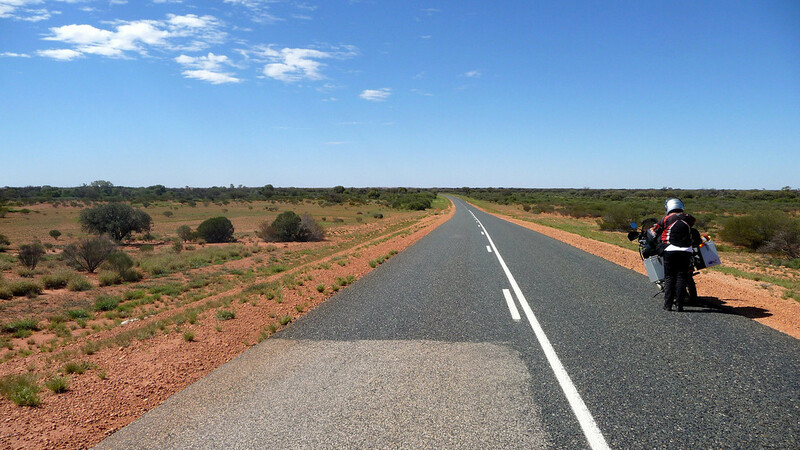 The 226 km [141 miles] journey had taken eight hours, rather than the anticipated three .. we were completely knackered because of the unexpected ordeal. AND our minds then turned to others within the biking community who regularly go out and ride these unsealed shite surfaces .. for fun? 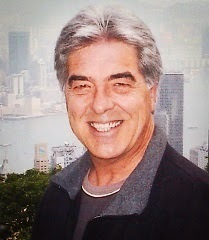 .. they must be stark-raving bloody bonkers ..
.. as must be Colin, the now revealed-to-be barking-mad boss of the Glen Helen Resort! .. grrrrrrrr!! 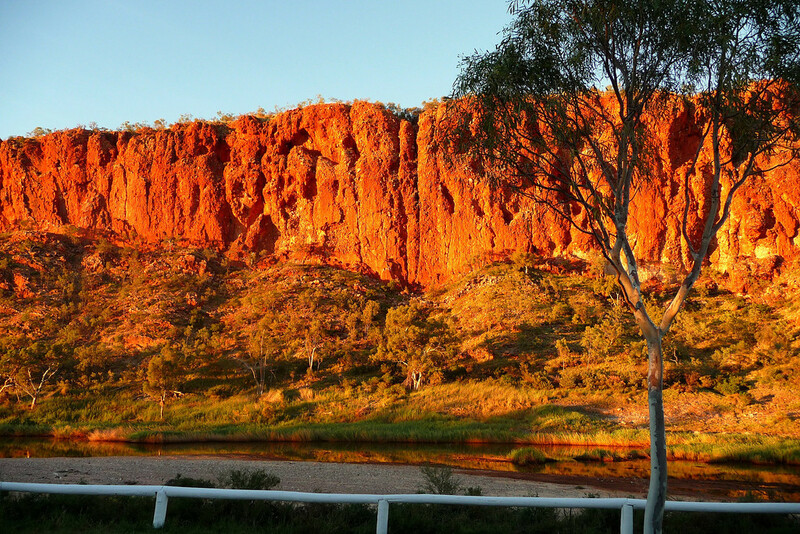 After checking into our lodgings, we just had enough time before dusk to snap a classic picture of the Canyon, turning red in evening's sunset. 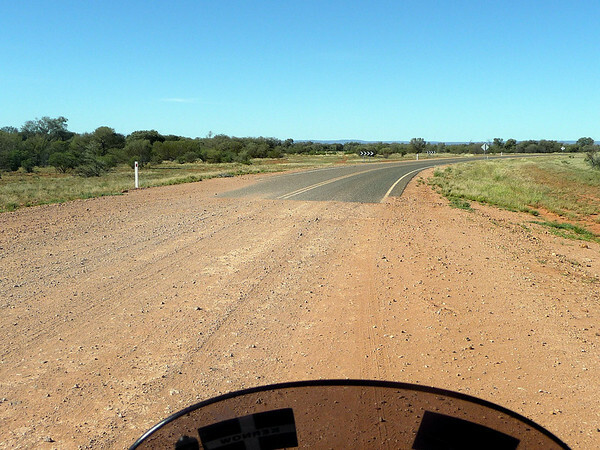 Just 86 km of sealed tarmacadam .. and 144 km of dirt! It's been a memorable and satisfying day. 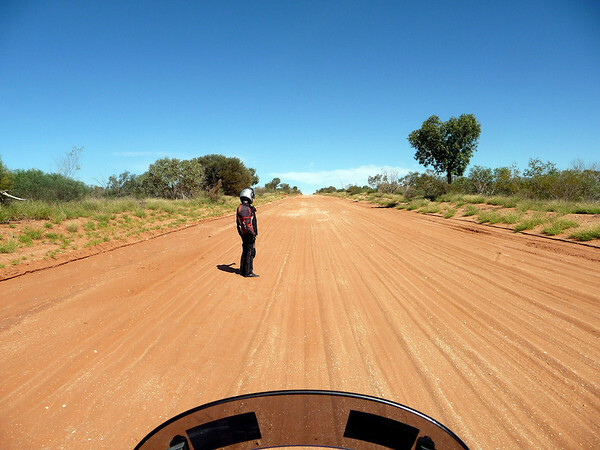 Although unplanned from the outset, we have nevertheless now successfully negotiated one of the great desert rides [still] of Australia. 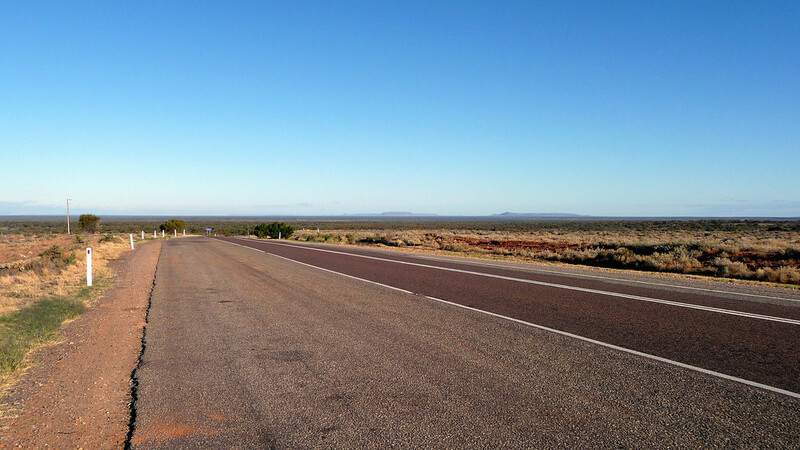 The 307 km [192 mi] run down south, in a big clockwise circuit mostly through low-lying bush from Kings Canyon to Yulara (or Ayers Rock Resort, which was purpose built to serve 'Uluru' /Ayers Rock) was unremarkable .. except for one thing, which was that for the first time in ages we actually started to feel a little chilly from a cooler-than-normal south-easterly wind; so-much-so that I felt the need to pull off the road and put on my fleece (under my mesh jacket) AND my thicker riding gloves. Clearly we're starting to feel the autumnal conditions as we move further and further south. 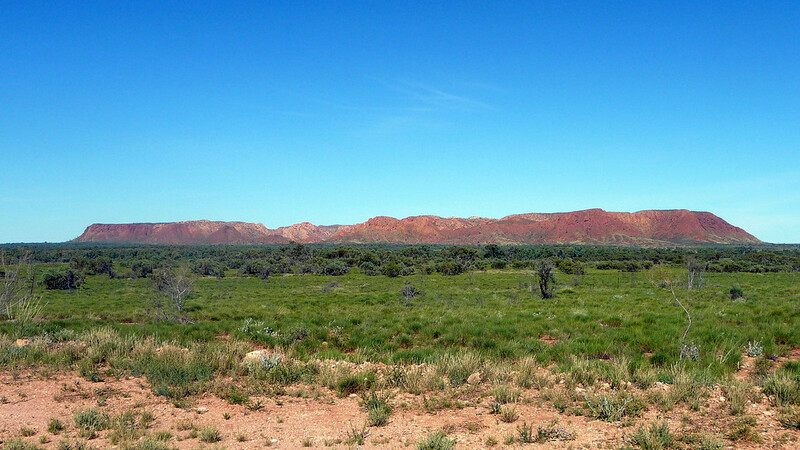 Towards midday we spot what we thought, at first view, was Uluru /Ayers Rock in the distance and noticed that it seemed kinda 'flatter' and more 'table-topped' than we were expecting ..
.. that's because this particular piece of 700 million year-old rock mesa isn't Uluru /Ayers Rock at all. 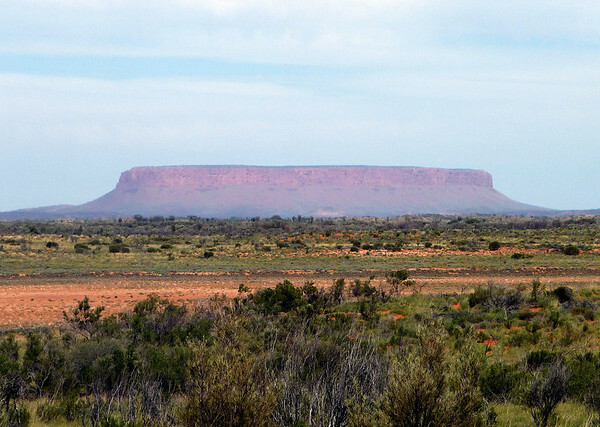 It is in fact Mount Connor .. which is three times the size of Uluru! 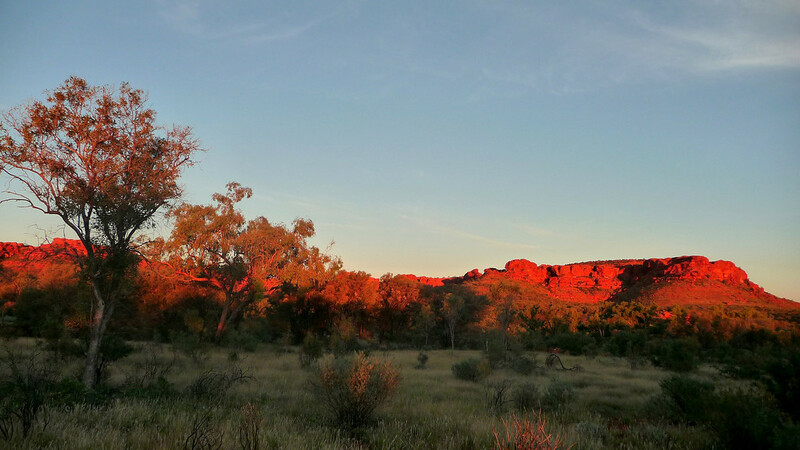 Mt Connor is sometimes referred to as 'the false rock' – which fooled us for a time (until a sympathetic Scottish lady put us right). 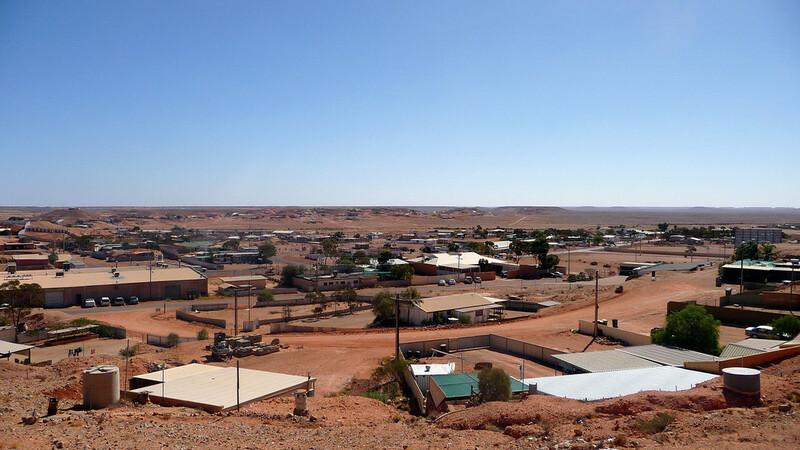 After another 110 westbound kilometres from 'falsey' .. (around 90 minutes) we were settling into our cabin at the Yulara-based campground. 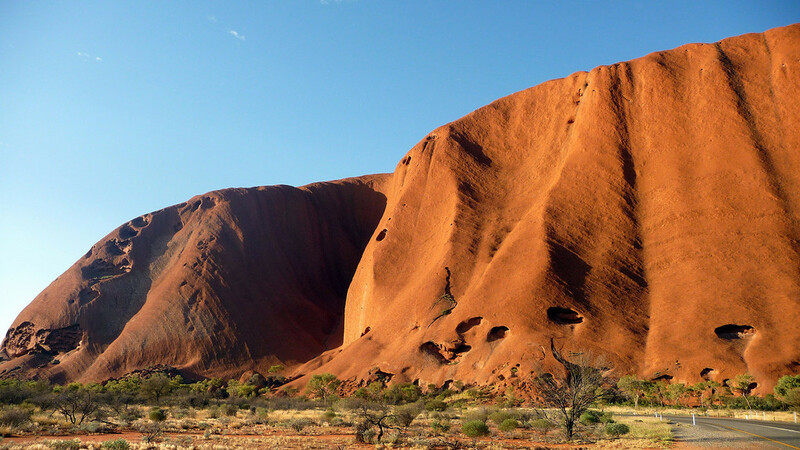 Soon afterward we're coughing-up 25 bucks each to enter the Uluru – Kata Tjuta National Park. I have to admit that I found my first sight of Uluru (Ayers Rock) quite an hypnotic experience; just couldn't take my eyes away from it! 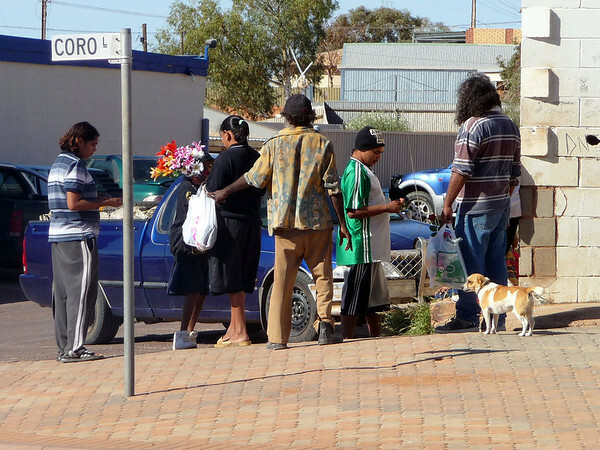 There are a few real Australian perceptions I've had in my mind for some time now .. yunno, the usual ones that define Oz and 'aussie-ness'. 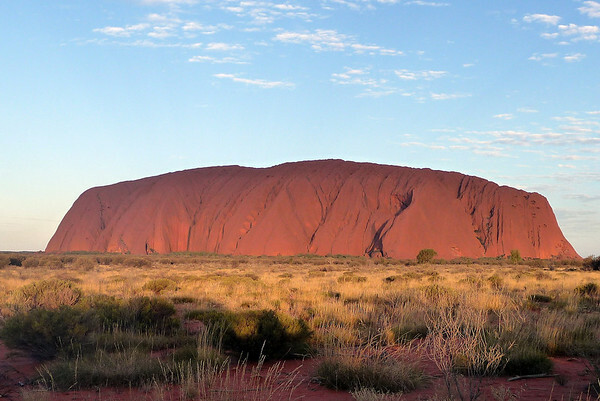 I'm talking about icons like: the Great Barrier Reef, Wave Rock; Sydney's Opera House and Harbour Bridge. Kangaroos and Koala. Boomerangs and didgeridoos. Aussie Rules Footie. 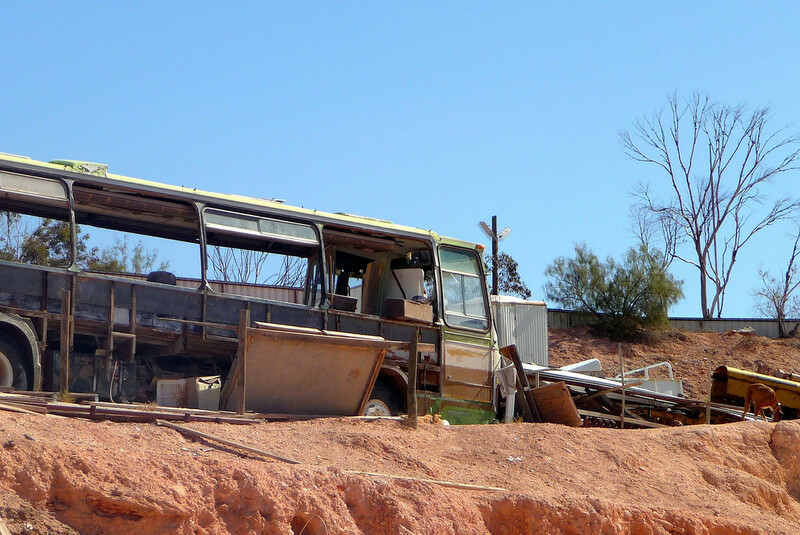 'Waltzing Matilda' .. 'Put another shrimp on the Baarbie mate' .. and forever saying 'No Worries'. 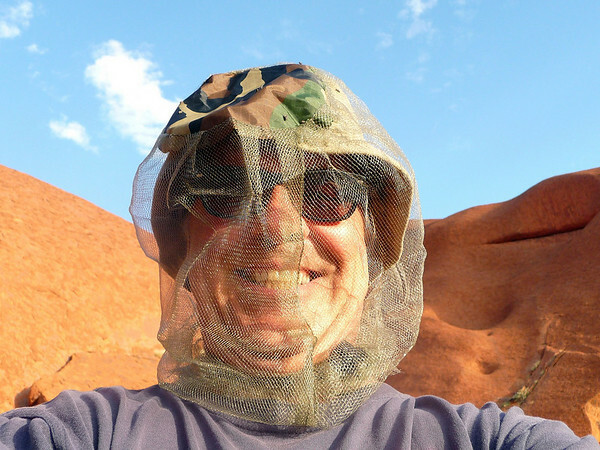 Personalities like: The Bush Tucker Man, Crocodile Dundee, Mel Gibson, Kylie Minogue, Evonne Goolagong (just for the namesake! .. ;o) - and, of course, the irrepressible, Dame Edna Everage .. 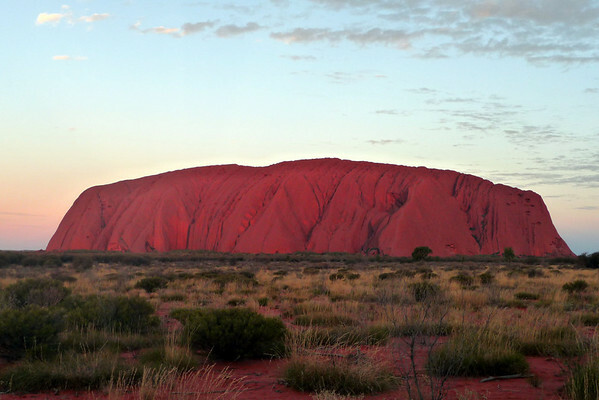 BUT perhaps the greatest one of all that absolutely epitomizes Australia is Uluru /Ayers Rock – because to my mind it represents THE very 'heart' of Australia – which is the reason why I chose to place an image of it at the top of my blog. So now that we're right here in real life, at the very spot .. well, I reckon we may as well go and take a closer look, eh? And why not?! 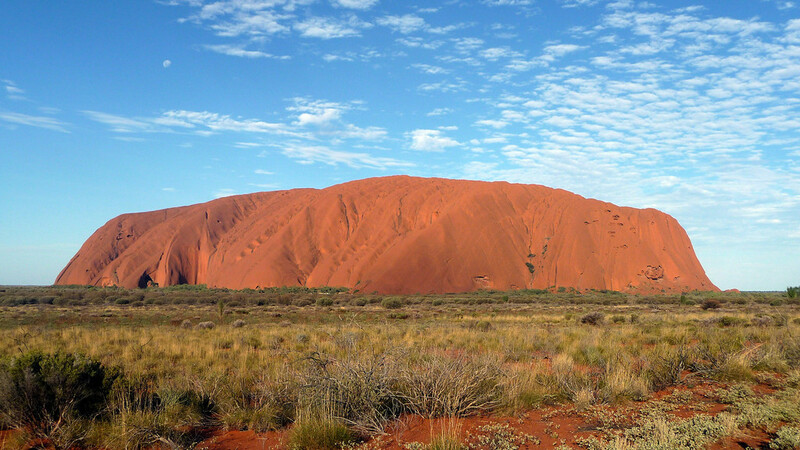 This is where you can climb up the Rock's surface .. that is, IF you're stupid enough to ignore Aboriginal culture and spiritual wishes. 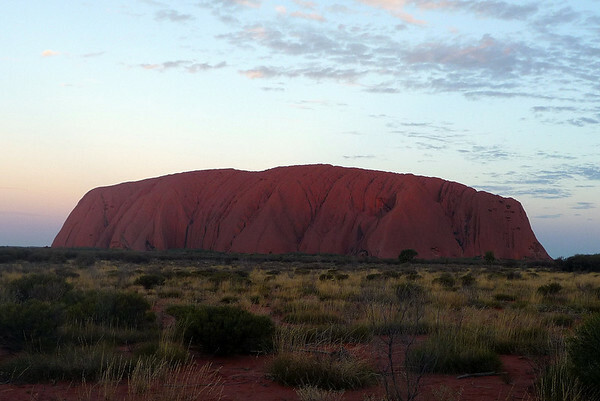 36 people have died while attempting to climb Uluru; many others have been injured. 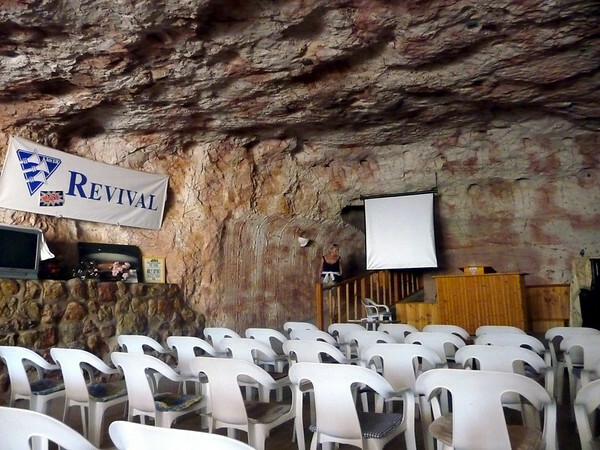 A sad coincidence of our visit here is that some unfortunate soul (the 36th one) died on the Rock just yesterday, Saturday-24th April. 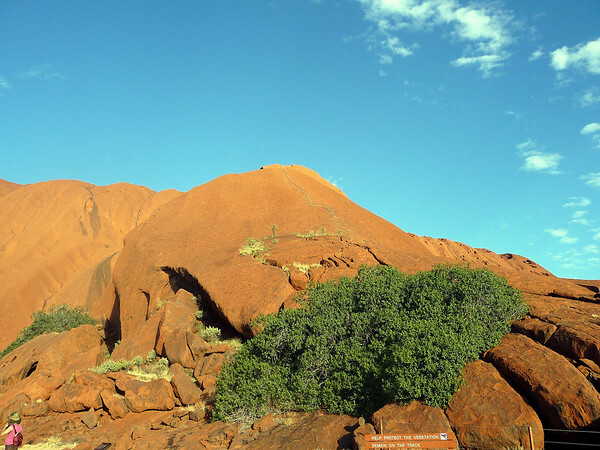 We choose to respect the Anangu People and the spiritual significance of their ancient laws by not attempting the climb ..
.. more to the point, we can't be friggin' arsed! What now follows below is a series of photos, shot by me at regular intervals of around 3-4 minutes, just before .. up to .. and right at the point of the evening's sunset (which, to be precise, occurred at 6:22pm). 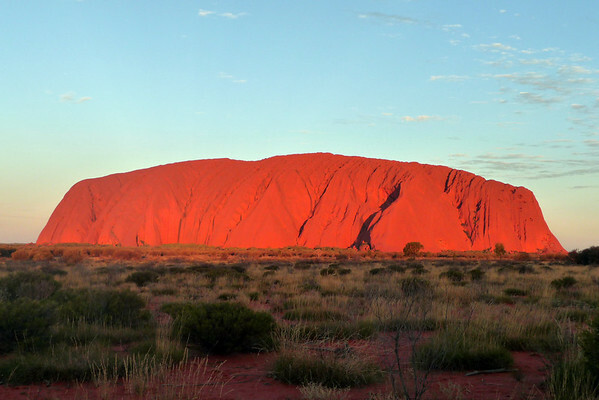 I heard that at this time of day the colour of Uluru constantly changes, right before your very eyes, from striking red, through grey/brown .. to dark ochre .. then into a mauve .. then finally into a shade of purple-y brown. Then the moon rises up from the west, right outta no-where! Deffo glad I came to see Uluru/Ayers Rock. 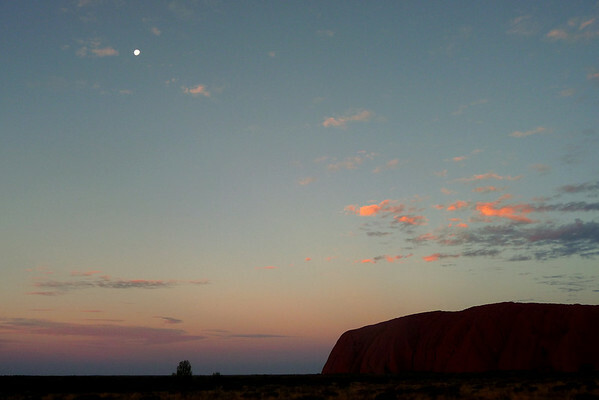 It's been another great day down under. 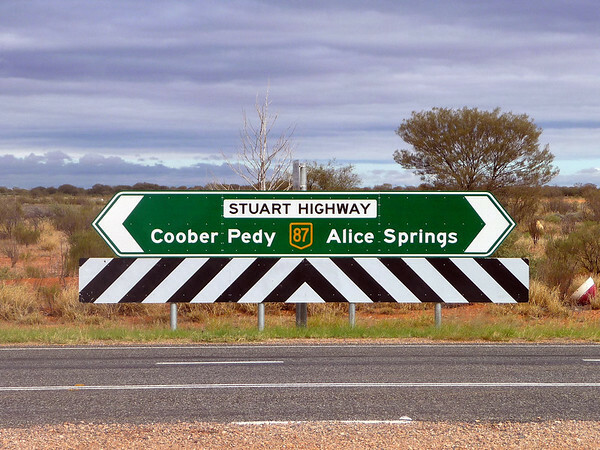 Alice Springs to Coober Pedy – Yeah .. Riiight! 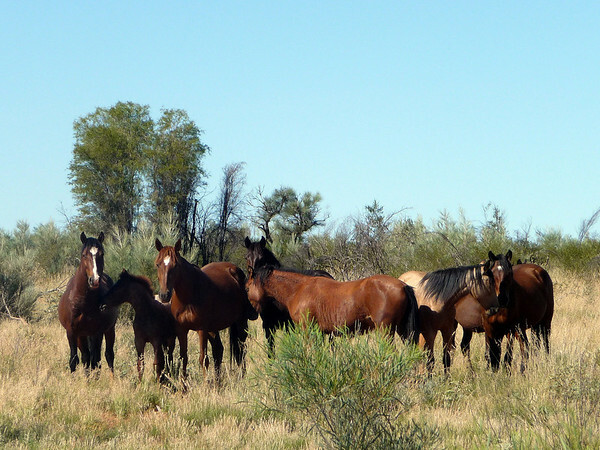 Just a jaunt down the road between two neighbouring townships, right? 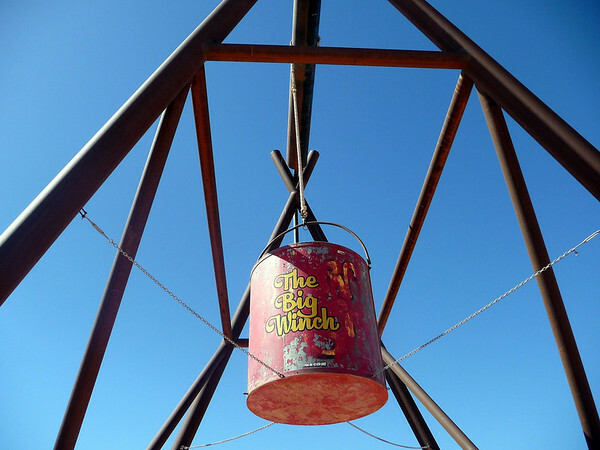 - with less than a handful of roadhouses (service stations often c/with accommodation and maybe some other amenities) in-between. 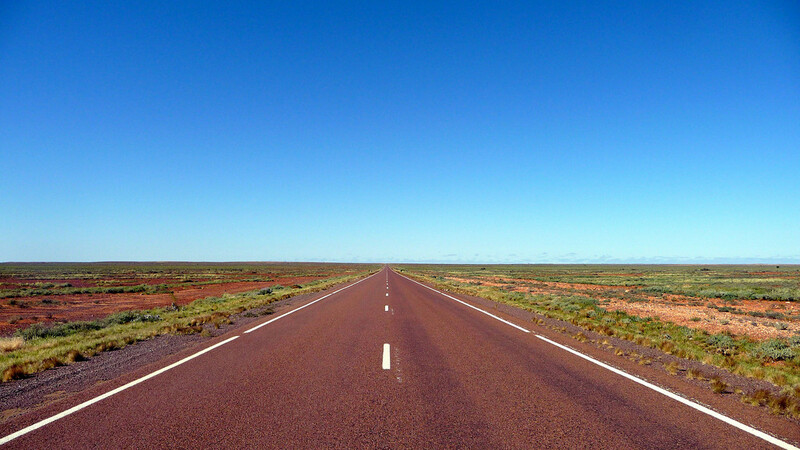 It's a distance of 690 km [431 miles] from Alice Springs to Coober Pedy. That's about the same as travelling from the north side of Dumfries in Scotland ~~> down to Saltash in Cornwall! 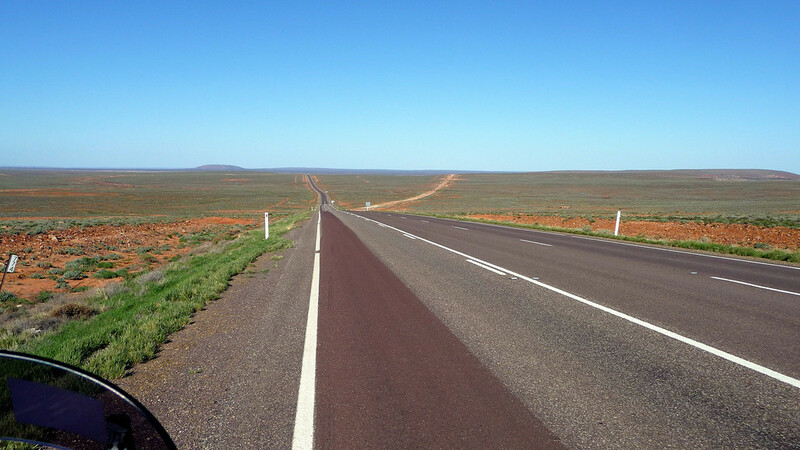 This gives you some idea of the vast distances involved when you're route planning around Oz. 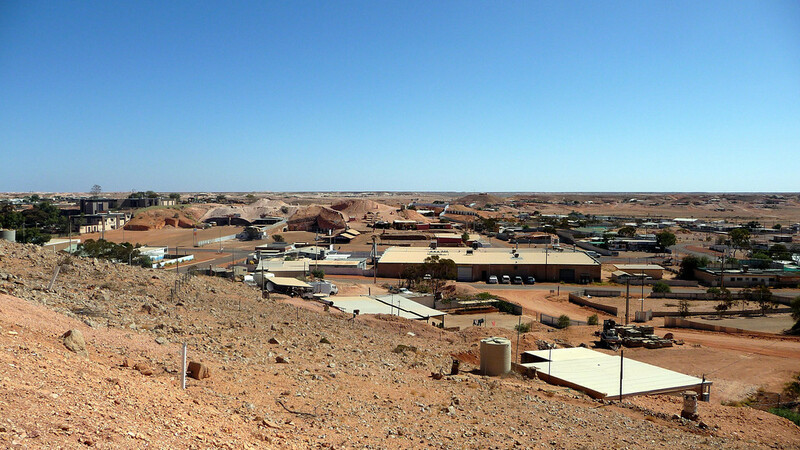 Just one little township to the very next one .. that's just down the road ... with nothing more than desert in between to look at! UNBELIEVABLE!! 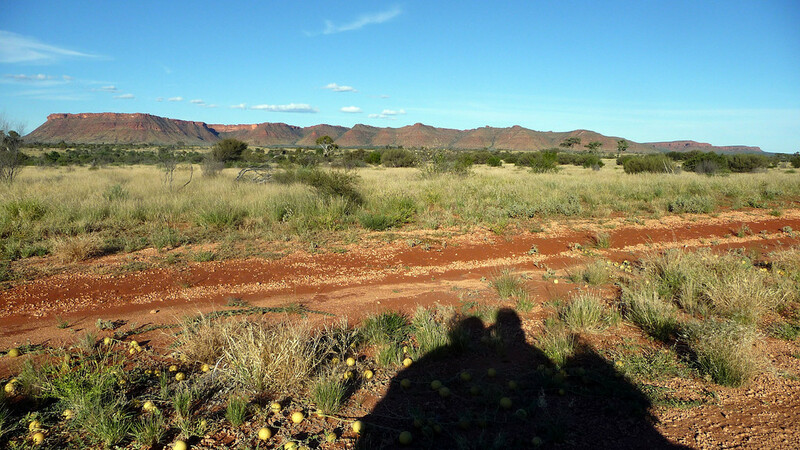 We spent Sunday night (April-25th) at the Kulgera Roadhouse .. and as roadhouses go, Kulgera ain't a bad one; not the newest or smartest .. but clean and friendly, which are the main attributes, in our humble opinions. 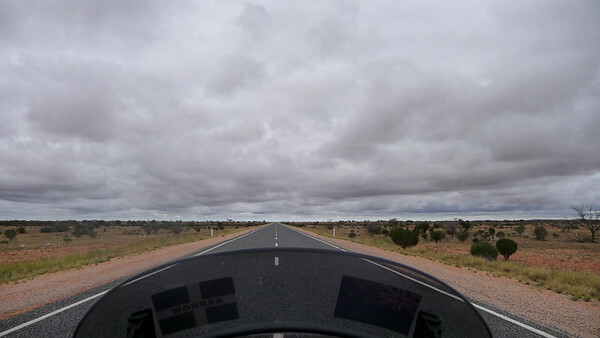 We left the Roadhouse, shortly after breakfast time, under an ominous sky ..
29 km [18 mi] – about a 20-minute ride later – we were at the Northern Territory / South Australia border. The circle is nearing its completion! 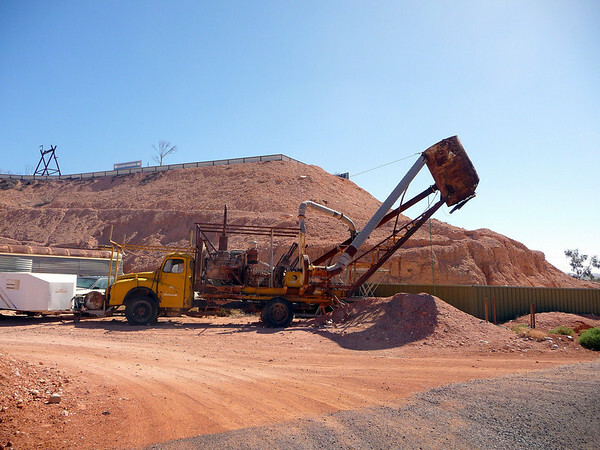 415 km [260 mi] later we were passing the mining spoils of Coober Pedy. 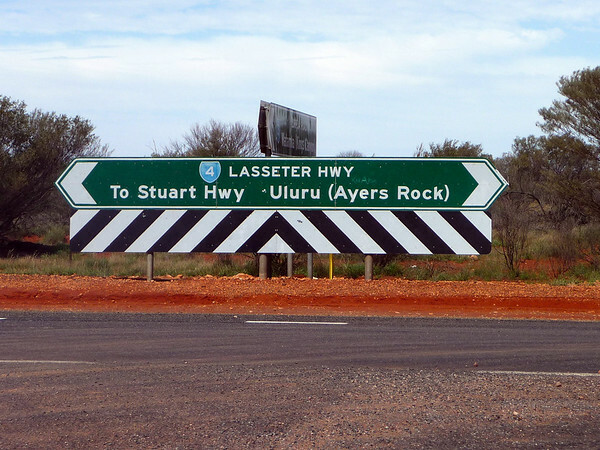 The above 'moonscape' will be familiar to anyone that's travelled along this particular stretch of the Stuart Hwy. 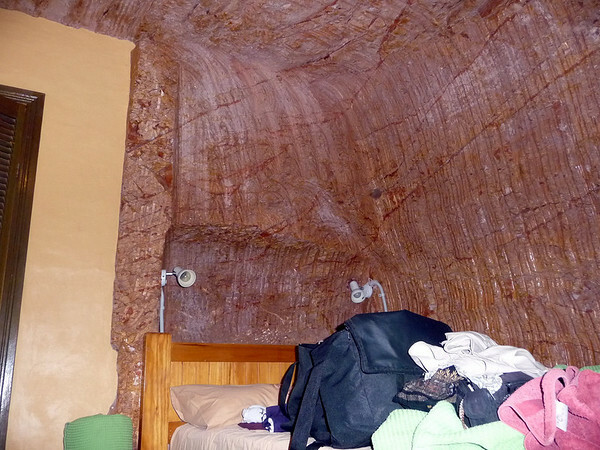 We were determined to spend at least one night in 'underground' accommodation. 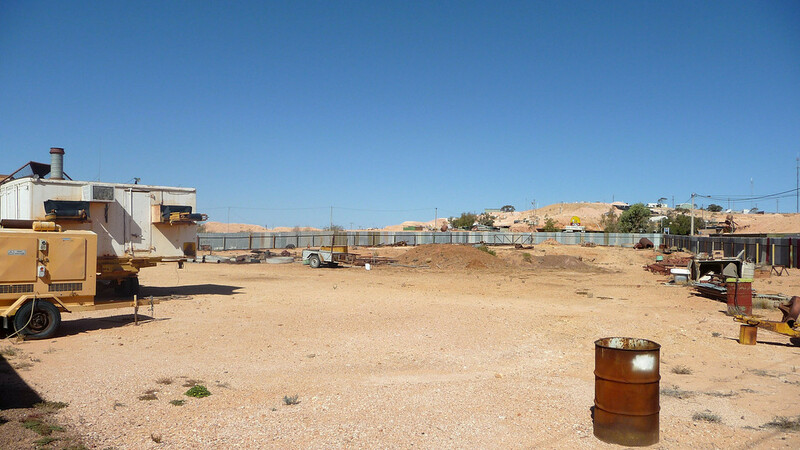 The name Coober Pedy is derived from the Aboriginal world “kupa” (uninitiated man or white man) and “piti” (hole). 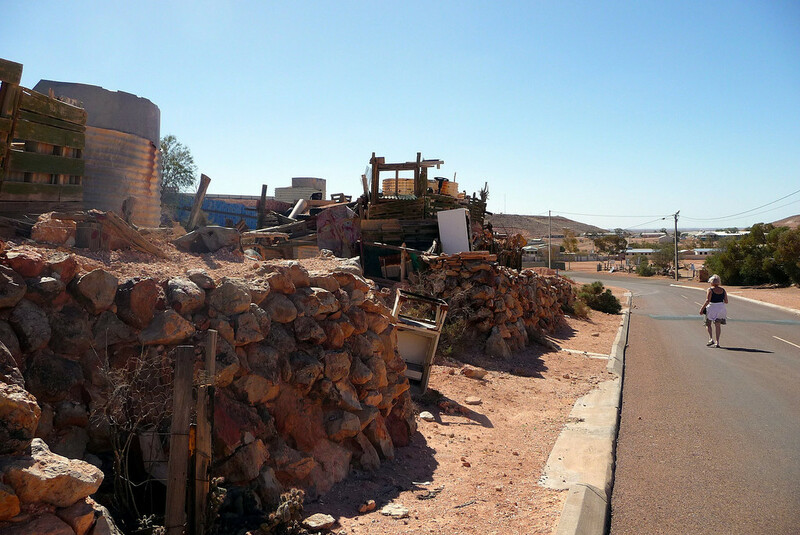 Since 1923 miners from more than 50 nations have arrived in this 'Wild West' township attempting to make their fortune – and many have succeeded. 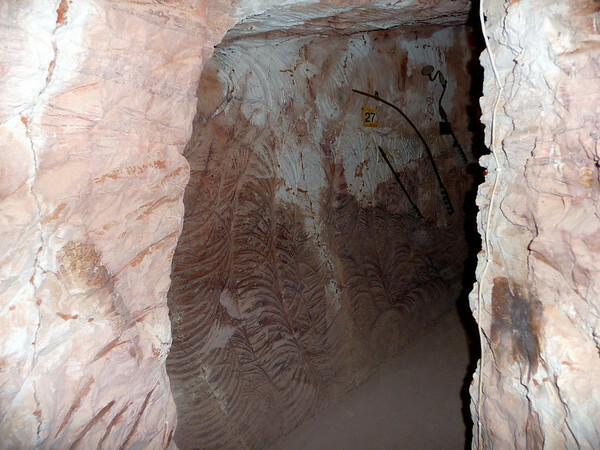 Coober Pedy is also famous for its underground tunnels and dwellings. 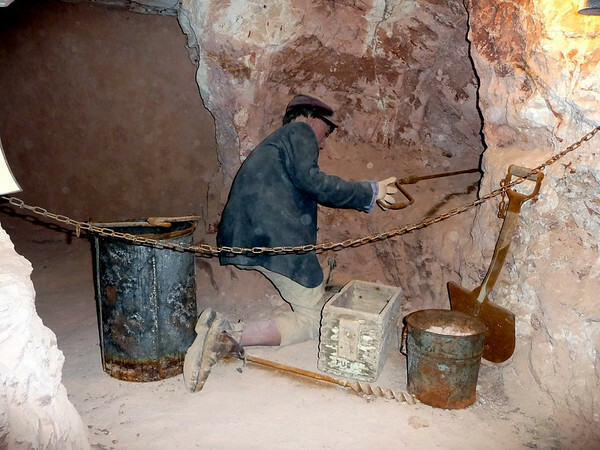 Early miners quickly discovered that underground tunnels were a cool escape from the scorching summer heat. 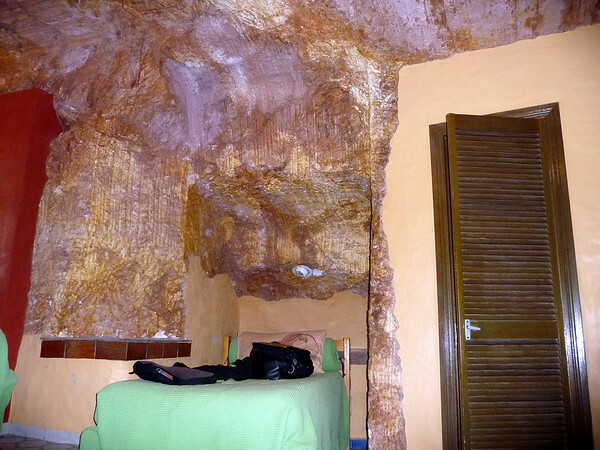 Today, visitors are able to stay in underground accommodation as a result. Nice stopover it is too. 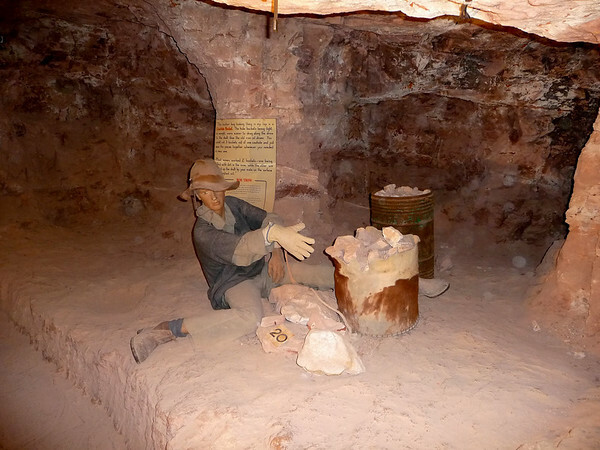 We did the touristy 'thing' by visiting The Old Timers Mine, which is worth the 10 bucks entrance fee. What can I say about the town itself? 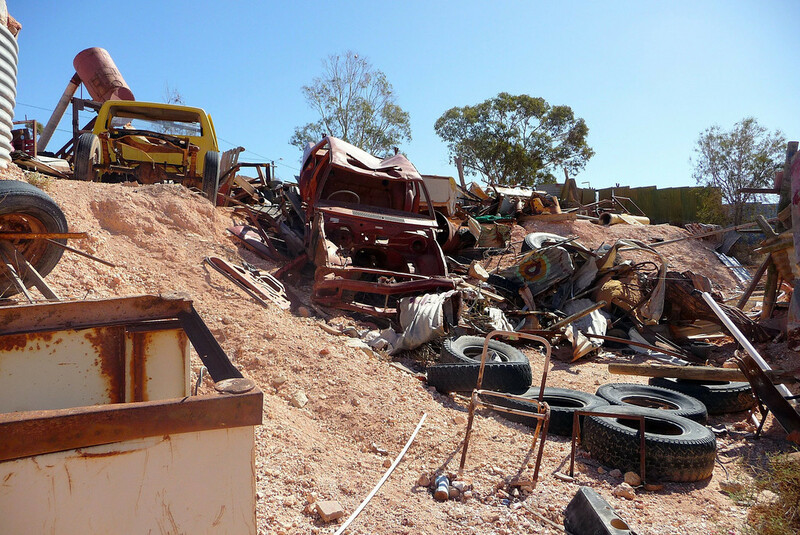 Well, for starters, let's take a look around ..
That's Coober Pedy from the main vantage point of ..
And we came to the conclusion that ..
.. it's just one big scrap yard! 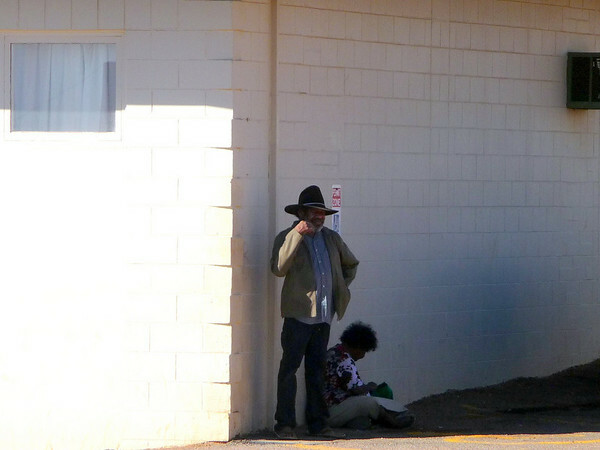 The local 'indigenous' folk ..
.. just hanging around street corners .. as per usual. 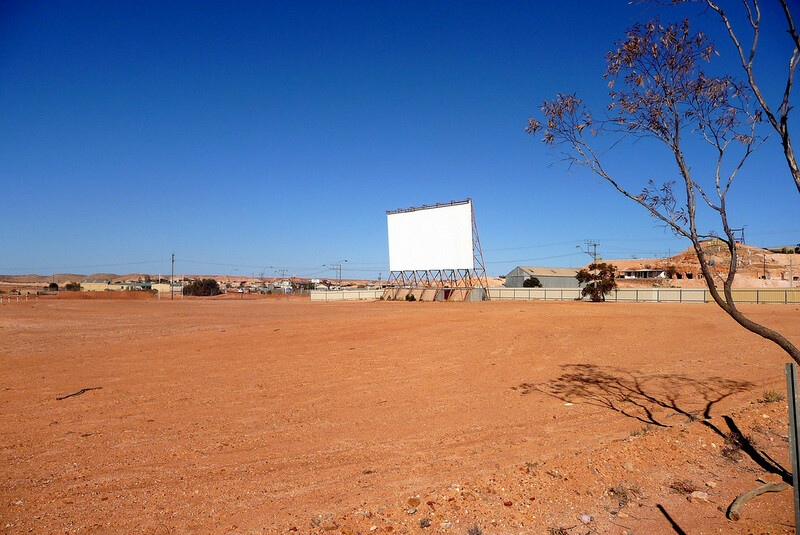 The local cinema .. that still screens movies once a fortnight. 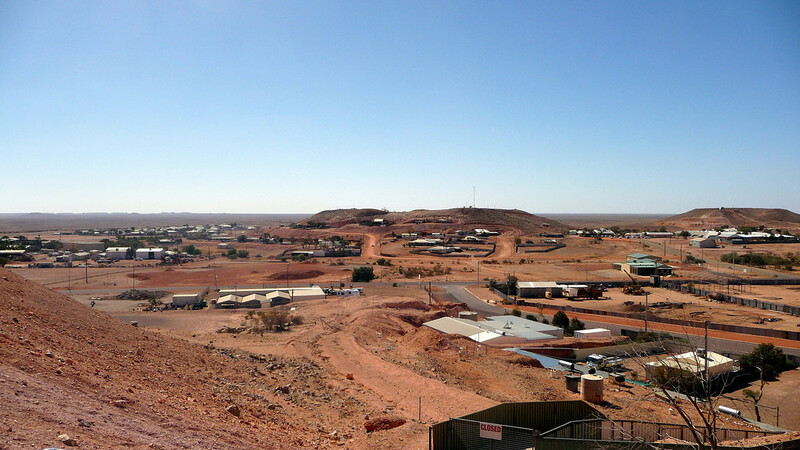 Summary: 'Hats Off' to the locals of Coober Pedy, for marketing their township as THE place of 'magic, mystery and hope' in the Outback. Pure bloody genius on their part. I reckon they could sell ice-creams to Eskimos! 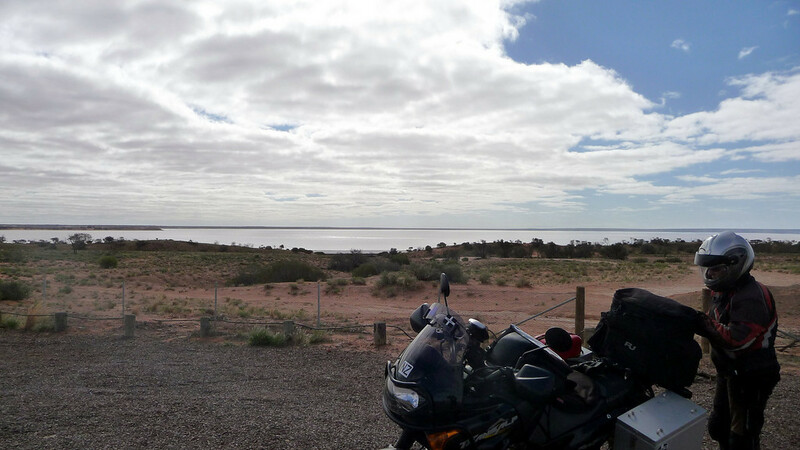 Today we face the second longest ride of the whole trip (the actual longest was, and remains as such, the run across the back end of the Eyre Hwy, from Caiguna to Esperance of: 583 km [364 miles] on March-21st). 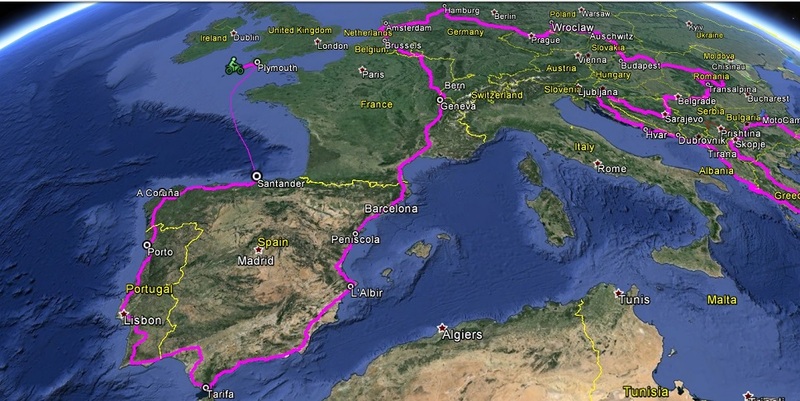 We shall cover around 540 km [338 miles] today. 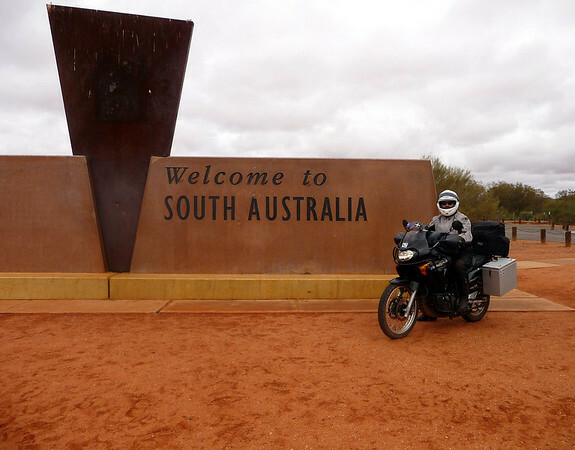 [My words]: From the time we joined the Stuart Hwy at Katherine on Sunday-18th .. it has now returned us here to Port Augusta, just where we were (same motel too) on Wednesday, March-17th, before setting off westwards to cross the Nullarbor Plain. Today we have come full circle – and Thank God .. we're still all in one piece.